I don’t know if it’s the holidays coming up or if it’s just my imagination but I feel like everyone is asking me when specials are coming up on Botox and fillers. I get it. Everyone always wants a deal, who wants to pay more for anything? The problem is you likely need your Botox every 3-4 months and specials usually don’t come around that often. You definitely do not want to bargain shop for cosmetic procedures because you may be sacrificing expertise and good results for a few bucks. Good news is there are other ways to pocket your pennies. So this post goes out to all you extreme coupon girls or really just anyone that wants some advice on how to save and still take care of your skin! 1. Brilliant Distinctions- If you don’t know what this is let me introduce you. This is a program that the Allergan company runs. Allergan owns Botox, Juvederm, Voluma, SkinMedica skincare line, Latisse and more. Once you are entered into the brilliant distinctions program you earn points with each purchase. Points convert into dollars. Then you can put those dollars towards your next purchase. You can use points from your retinol for Botox or points from Latisse towards fillers. However you want to use them, you can! I have seen big savings here so come sign up. 2. Schedule your Botox like your hair appointment. At Johnson Dermatology if you make your appointment for your next Botox at the time of your injection you get $25 off your next injection. Botox is like getting your hair colored. You don’t wait until your roots are completely grown out to recolor, you schedule it every 6 weeks. It’s much easier to touch-up that way. Some of my patients that really keep up with their Botox like this can go 6 months because that muscle has weakened. Double savings, $25 dollars off and eventually you can go longer between injections. 3. Save on moisturizers, washes and facials- Moisturizers, face washes and facials feel good. They can be luxurious. But the truth is they are not the work horses changing your skin. Buy off brand plain old moisturizers and face washes and save that money you were spending on expensive fancy moisturizers embedded with pearls hand shelled by mermaids on the beaches of Bora Bora and put that money towards your injections or retinol or peels, something that will improve your skin. 4. Get on the Johnson Dermatology e-mail list- If you put your e-mail on your patient registration that doesn’t mean you automatically get e-mails from us. You have to request to be on our e-mail list. Once you are on our e-mail list that will be how you are the first to find out about any news at the clinic, including specials. 5. Quality over quantity- Make sure your injector is cost conscious and full of skill. A lot of the studies that I read on Fillers they are using 6-8 syringes, Dr. Sandy and I rarely use that many syringes. We are pretty conservative and together we have agreed that with the right placement of the filler less can be more. Every individual is different and some people may need 8 syringes but most people do great with much less than that. So yes, I just tooted my own horn. Just by picking Johnson Dermatology to inject you, you saved money…. haha! 6. Buy in packages- We have laser packages that come with TNS serums or skin care packages with a full skin care regimen or Latisse with laser packages. What it boils down to is that if you buy your favorite products separately you will pay more than if you buy them in a package. Get down to the clinic and pick the package that fits your needs best. Hope these tips help. We try very hard to be cost conscious at Johnson Dermatology and still offer you the BEST care and products out there. Have you heard of Beliebers? They are obsessive Justin Bieber fans. Not just fans, but true lovers of Justin Bieber. Well Justin Bieber fans aren’t the only ones who can smash words! And then was born via my mind a Latiever. A Latiever is someone who is a HUGE fan of Latisse. For those of you that don’t know, Latisse is a topical medicine that thickens, darkens and lengthens eye lashes. The Latiever movement is coming so you may want to be one of the cool kids and jump on the bus now. I haven’t always been a Latiever and it took some time for me to convert. I am blessed with lashes that hit my glasses lens so if it’s not something I use, it just takes me longer to join the bandwagon. Here are the top reasons I became a Latiever and you should too. 1. My Mom’s testimony- So my sweet Mother has been through what we call the “Johnson Dermatology Mill”. She has had filler and laser and so on and so on. But Latisse is the one thing she is so amazed with. Quite frankly, it’s one thing that I am so amazed with on her. I think as a society we all focus on sagging and wrinkles but we don’t realize how much thin, short, sparse eye lashes age us. Mom’s new and improved darker, thicker, longer lashes took years off her eyes. 2. It’s the natural look- Okay, please tell me you look at people’s eyelashes when they are fake and immediately know they are fake. I mean either they just look fake or they fall off funny. Have you seen that girl at the club that worked up a sweat dancing all night causing her lashes glue to melt, her eye lashes are half on her upper eyelid and half on her eyeBROW. Just don’t be that girl. Latisse is still YOU, still your lashes. It’s natural beauty. 3. It’s time sensitive- Hours laying there while someone individually glues lashes to your lids and perfects your lids…… ain’t nobody got time for that! I have never had fake lashes placed so when one of my girlfriends recently told me it takes hours on hours, I almost fell out. Latisse is a simple topical application once a day, no biggie. 4. It’s cost conscious- I was at a benefit and roaming through a silent auction and saw this mascara with fibers that lots of people are using right now. It said the value was $150 and my jaw dropped. For mascara? Really? With Latisse you won’t need that fancy mascara and you won’t have fibers and thick mascara flaking off on your eyelids and cheeks. As a matter of fact with Latisse some of you can axe mascara all together. We have some killer Latisse packages at the clinic right now so call and ask about them! 5. It’s simple and easy- You just drop some liquid on your lash line once a day. No 5 step applications of mascara, no applying your own lashes then mascara, no going to a salon and getting lashes for hours and no icky goop on your eyes and skin around your eyes. I’m a simple girl and I like to keep it that way. Would you like to learn more about Latisse? We have a Latiever group of women at Johnson Dermatology who would love to teach you! Autumn, JoAnna, Shelly, Dr. Sandy, Honey and I are here to give you admittance into our club with all the info your heart desires. Come see us at the clinic and become a Latiever. Disclaimer: Latisse does require a prescription so you need to be evaluated by one of the providers to make sure you’re a good candidate. One of my favorite packages is sublative laser tightening around your eyes, TNS eye repair (growth factor) and Latisse. It’s a crazy deal that will tighten all that crinkly skin around your eyes and give you that youthful look you’ve been trying to get back. Hope to see you at the clinic soon. Pumpkin spice is taking over menus world wide. That’s the official sign fall is here. To some people that means good bye to water sports, camping, no school and drinks by the pool. It also means hello to fur coats, snow days and ugg boots. To a dermatology girl it means “see you later” bug bites, sunburns and fungus and welcome back dry, itchy skin. A cold front moved through the Fort this weekend and it felt pretty good. Now is the time we all start to change our wardrobe for the cold weather that’s ahead and it should be the time we change our skin care habits too. Ward off dry, itchy, cold weather skin with some of my skin care advice and avoid that uncomfortable itch this year. Happy Fall Y’all! 1. Moisturize more often- During the summer months you may only moisturize after bathing. During the cooler months of the year make it a point to up your moisturizer game. Attempt four times a day and maybe you’ll get three in! 2. Avoid irritants- So all year I tell you to ditch the high fragrance, high color, glittery moisturizers but some of you use them anyway and may not have any problems. Well during the Summer you may be able to handle it but during the winter if you’re prone to dry itchy skin, for sure ditch that high fragrance moisturizer and soap. I like plain dove soap to wash with and vaseline to moisturize with. Other irritants include harsh washcloths, loofas, scrubs and beads. 3. Shower smart- Some people shower every other day during Winter months. I gotta shower everyday because I’m a workout girl and nobody wants to smell me after a good workout. That’s okay, try to shower in luke warm instead of real hot or real cold and pat dry leaving yourself a little damp. Keep your moisturizer in the shower and lather it on while your still slightly damp to lock all those droplets of moisture into your skin. I can’t use vaseline for this because it’s like mixing oil and vinegar so I use a jar of Cerave SA. The “SA” part helps get rid of some of those dry flakes too. 4. Use a thicker moisturizer- You change clothes with seasons so change your skin care line too. During the summer I wear powder sunscreen but during the winter I switch to Elta MD facial sunscreen so I can get some extra moisture there. At night during the summer I typically use only Retinol but during the winter I add Avene Hydrance Optimale cream to my regimen. It’s a thicker facial moisturizer but doesn’t leave you greasy so it makes for a nice winter option. For my body I stick with vaseline but if your not down with the grease then you can use pretty much any cream that is plain and comes in a jar. Think of pumps and such as being too thin lotions for winter skin. 5. Don’t forget your sunscreen- You can burn in the winter too. You can get sun exposure period. Even though it’s cold outside the sun still rises, protect yourself. 6. Put a pot on the stove- I mean you could use a humidifier if you want to help add moisture to the dry air but it’s so easy to be fancy. I put the biggest pot I can find full of water and add orange peel and cloves and then let it basically cook down. It gives your house some moisture and the best fall smell ever. I don’t care how cliche it is, everyone should go get a pumpkin spice latte this week to kick off this awesome weather rolling in! Winter season is the perfect time to correct some of that sun damage you got on your skin this summer so please come see us at the clinic and let us help your skin! We love taking care of your skin and always appreciate your trust in us! So this week Johnson Dermatology is scheduling people for a boot camp for skin. It’s our inaugural boot camp and I am so excited so I had to share it with you guys. This bootcamp is for people who want the best skin they can have. It’s for people who have been using every product under the sun yet never accomplished their goals, never saw change. This week, if you sign up for the 90 day challenge you will finally see change. So today’s post will explain why and how we are going to get you there in 90 days. The Boot camp includes the following. 1. Skin care regimen for 90 days. We will include Retinol, Growth Factor, Sunscreen and Lytera. With this regimen you will wash your face and moisturize morning and night. You will also use two creams in the morning and three at night. It’s simple, no 8 plus steps. These products will help shrink your pores, even your texture, even your tone, get rid of discolorations, help with fine lines and brighten your skin. 2. UV imaging of your skin- This allows you to see “age spots” that haven’t “bloomed” yet for lack of a better word. Think about it as seeing your skin’s damage at a more scientific level. We will do this once monthly so that you can watch your progress. 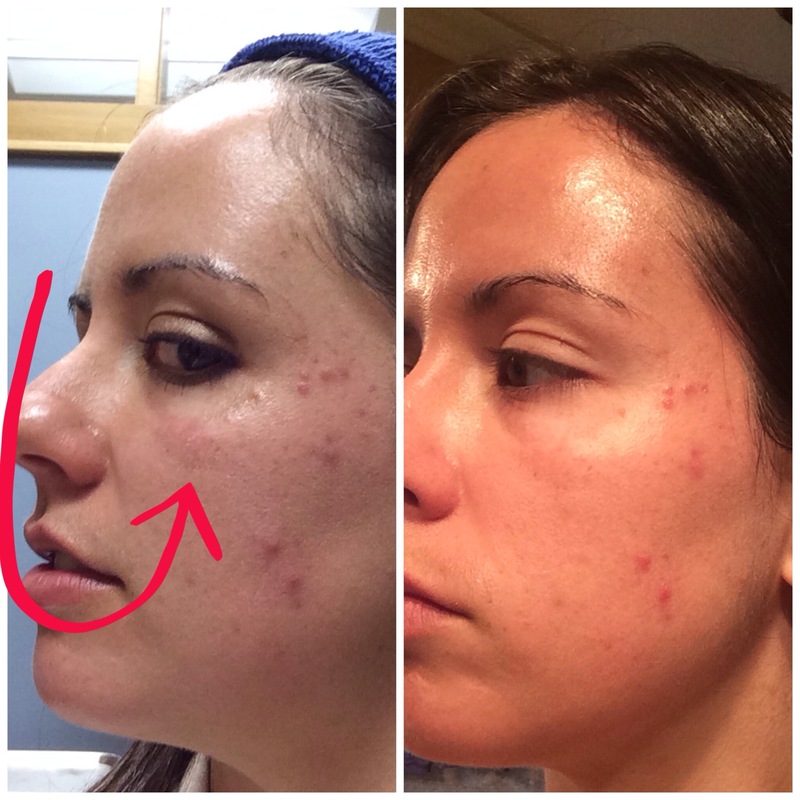 It’s a really fun way to see how you’re skin is changing. 3. Three monthly Vitalize Peels- These peels are really amazing. I recently had a bad acne break out and received one of these peels and it practically erased one of my brown spots. Peels are like working out. If you get off the couch once a week that’s better than nothing but if you work out three times a week you’re in even better shape. After one peel you will notice a difference but with the series of three you will see even more amazing results. If you have discolorations, uneven skin tone, acne, rough or dull skin then this peel will amaze you. The left is immediately before my Vitalize Peel. The right is about a week after (I was on vacation not sure exact timeframe). I am still red from the peel but if you look where the arrow is pointing you can see that brown spot is already looking better. And look at the two brown spots on my temple, above my brow, almost gone! A full Botox injection and a Latisse! Botox is for those lines in motion that you don’t want to turn into lines at rest. It will also soften lines at rest over time. It’s the one thing that always makes me feel so refreshed. Latisse will lengthen, thicken and darken those aging lashes. You never realize how much your lashes age you until you have them back like you were 16 again. I saw a $125 mascara this weekend and thought to my self, “wow, that’s sad because with a little latisse you really don’t even need all those fibers and thick mascara that fall all over your eyelids and cheeks all day”. Everything included in the boot camp totals about $2400. We are offering it for $1200. It really is a bargain for those people who want to commit to a healthier, refreshed, beautiful skin. Go to your bathroom and total up how much all the lotions and potions in your cabinet have cost you. Studies show that most of you will total well over $1200 on things that never got you the results you expected. This boot camp is to bring your inner beauty out through your skin. Let your soul shine. If you’re interested in the boot camp there is a lunch and learn tomorrow at the clinic that will go into more detail about the products and plan. Call in the morning at 479-649-3376 to let us know if you’re coming. If you are interested in learning more about any of the products or peels individually feel free to call for a one on one skin care consult with one of our cosmetic concierges, they are a lot of fun! Hope to see you ALL there tomorrow. I’m always reading lists on blogs and social media. “The ten worst types of Moms”, “Five things you must do on your honeymoon”, “Top ten colleges”, “Top cities to live” and so on. I mean David Letterman has a top ten everynight! I’m always drawn in to read these lists and find out what makes “the top” whether it’s a topic I’m interested in or not. So to join in on the list making fun I made my Top Ten Skin Types List. Enjoy! 9. The Confident Skin Type- The person that gets a pimple and doesn’t pick and pop it to try to make it more socially appealing, just leaves it alone. Then goes to the prom and rocks out like before mentioned pimple doesn’t exist. 8. The Untouched Skin Type-This skin doesn’t get picked, popped, scrubbed, exfoliated, scratched, vigoursly itched nor irritated. It’s a calm and beautiful skin that any dermatologist can recognize. 7. The Retinoled Skin Type- I made that word up. “Retinoled” defined is skin that has been using a retinol for at least four months. This type has smoother texture and tone and is just a little closer to flawless. 6. The Imperfect Skin Type- This type of skin rocks a normal mole, is proud of it’s birthmarks, considers itself imperfectly perfect. This skin type is recognizable by most. It’s a first cousin to the confident skin type. 5. The Laser Hair Removal Skin Type- This skin has had its underarms, happy trail and bikini line lasered at least. No folliculitis here, no razor burn, no hard work shaving everyday and definetely no harsh waxing. This skin type is perfect for island life or anyone that lives a relaxed, chilled out lifestyle. 4. The Simple Skin Type- This skin has a very simple skin care regimen. No eight steps in AM and twenty steps in PM, no million dollar skin care budget, no fru-fru fragrances and no 234 products that most women own. This skin type may only use sunscreen in AM and Retinol in PM, simple but ahhhhhmazing. 3. The Natural Nails Type- Nails aren’t skin you say? Well they are a dermatologist specialty so they made my list (we do hair, nails and skin FYI). This type doesn’t push its cuticles back, doesn’t dig at it’s nails, doesn’t have fake nails that can damage the nail plate. This is just a natural nail with maybe an occasional polish. This nail looks healthy and to me that’s the most beautiful thing in the human body, our health. 2. The “Have it all” Skin Type- This skin has been lasered, peeled, sun protected, uses Retinol, Growth Factor, Lytera and moisturizer, has had Botox and Fillers and gets a skin cancer check at least once a year. This skin is the best it can be and makes me want to dance to Beyonce. 1. The Sun Protected Skin Type- You know this is my number one. No premature aging, no sun damage brown spots, no early wrinkles, no increased risk of skin cancer, no looking back with regrets and no orange peel look. You know, no UV damage is beautiful. This skin is the color God made it. What skin type are you? Obviously these are my favorite skin types but just know all skin types are welcome to join one, if not all of these clubs. If you need help with that then I hope to see you this week at the clinic. Hope you are having as much fun on this Labor Day Weekend as I had making this list.